Ace Star BnB Backpacker Hostel i Mandalay, Myanmar: Reservér nu! 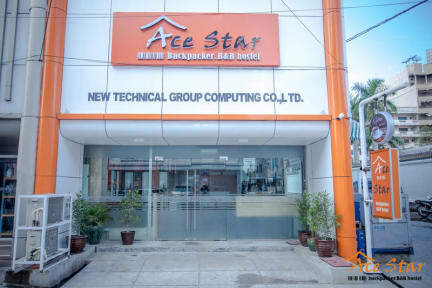 Now Ace Star has Information Officer (I/O) and he provides all of the informations to guests by two languages (French & English) . Ace Star has many tour programs such as day trip plans around Mandalay,Pyin Oo Lwin Day trip plan, Monywa Day Trip Plan, Hispaw night stop plan , Nga-Lite Elephant Camp night stop plan , Village Tour around Mandalay ,Hiking Tour Near Mandalay. So pls join to our hostel and have a fun during your holidays ! - as well as a new state of the art Hospital and Mandalay Railway Station . You are always welcome to bring in your own beer or wine to the roof garden to share a glass or two with your fellow guests who might then become your future life-long friends. All services that the 21’st century traveller would expect to find can be found here -comfortable and private bed space with individual light and hooks to hang those things which need not go in the under-bed lockers. You can of course also hire your own bikes from here as well as private taxis to all destinations including the airport. Outside of the hostel is free secure private parking for your own vehicles. Within the offer of very reasonable overnight cost comes a very ample free breakfast and permanent free coffee and tea on the Roofgarden terrace. Free wi-fi within the hostel keeps the traveller in touch with everything and everyoneand free security lockers and baggage storage are available. Be sure to bring your own personal padlocks.